A sample of the more than 100 images that augment the text. Upper Row: (Left) Lancelot’s (HK97’s) chain mail capsid courtesy of Gabriel Lander. (Center) E. coli besieged by Lander (T4) courtesy of John Wertz. (Right) A Positivist (SPP1) virion courtesy of Rudi Lurz. Lower Row:(Left) Cross-section through Shy’s ( φ6’s) virion depicted by Leah Pantéa. (Right) Hydrodynamic model of DNA ejection during infection depicted by Leah Pantéa. 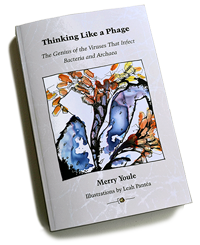 in which we meet the 21 pheatured phages who star in the chapters that follow. in which phage chromosomes, having entered their host cell, outwit the patrolling cellular defenses. in which the phages take over their host cell and redirect its activities toward making more phages. in which the newly-minted phage proteins and chromosomes assemble themselves into progeny virions. in which the progeny virions escape from the cell that had supported their production. in which lucky drifting virions collide with a potential host cell and locate their receptor on its surface. in which virions deliver their chromosome into a new host cell – the first step in launching an infection. in which temperate phages reside for extended periods within their host cell for mutual benefit.